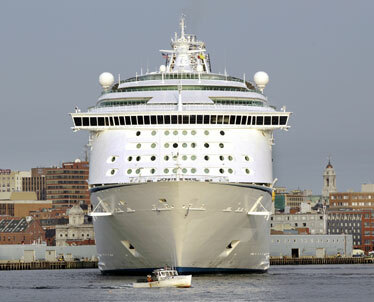 The Explorer of the Seas cruise ship backed into the Maine State Pier in Portland, Maine, in September. Because of a proposed change in federal rules, the city is now wondering how many, if any, cruise ships will be calling this summer. Similar concerns are being raised in ports from Alaska to Florida. Every year cruise ship companies pour millions of dollars into ads inviting travelers to "drink in the splendor," "savor the essence" and "explore the magic" of Alaska's vast glaciers, towering mountain peaks and pristine waters. But what if their ships had to spend more than half their cruise dawdling in British Columbia, Canada, before they could sprint north for just a quick peek at the magic, then scuttle back to the home port in Seattle? "It would be tough to sell an Alaskan cruise if they could only come for one day," said Andrew Green, the Juneau port manager for Cruise Line Agencies of Alaska. A continent away, in Maine, the city of Portland's gleaming, $21 million terminal for cruise ships and ferries will open this spring. Another $7 million berth built to accommodate the world's largest cruise ships will follow next year. Now the city is now wondering how many, if any, cruise ships will be calling this summer. "It could be potentially devastating. There's no question about that," said Jeff Monroe, the city's transportation director. Other U.S. ports would be affected. Key West, Fla., for example, could get skipped altogether by cruise ships traveling from Florida's mainland to the Caribbean. At the heart of these ports' problems is a proposed federal rule intended to help NCL America's two remaining Hawaii-ported cruise ships. The U.S. Customs and Border Protection agency must decide on the fate of the rule change, which could affect the itineraries of cruise ships whose visits are being counted upon in port cities around the country. The Cruise Lines International Association, which represents 24 operators including Carnival Cruise Lines, Celebrity Cruises, Holland America Line and Royal Caribbean International, warns that about 10 million U.S. vacationers stand to have their cruises altered or canceled unless the federal proposal is changed. In the case of the Alaska cruises, the change would either curtail how much time many ships spend in Alaska ports or require a massive redeployment to Vancouver, British Columbia, of hundreds of vessels now scheduled to leave from Seattle and San Francisco. "Our options would basically be to adhere to it in some manner or to litigate. If we had to change the itineraries, that in itself would create a great deal of commotion," said John Shively, Holland America Line's vice president for government and community relations in Alaska. As proposed, the rule would require that ships that are registered in a foreign country and embark and disembark passengers from U.S. ports, spend at least 48 hours in a foreign port. The rule further states that the amount of time they spend in a foreign port has to equal 50 percent of the total amount of time spent at U.S. ports of call. 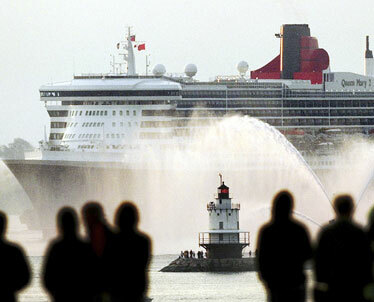 The Queen Mary 2, the world's largest luxury liner, dwarfed the Spring Point Light as it glides into Portland Harbor in Maine in 2004 . About a third of the 500 cruises bound for Alaska this year would fall under the new rule. It would take a big bite out of their mostly seven day itineraries to Alaska. "It makes everybody very anxious because it would take a significant cut out of the market, a significant reduction in the number of people who would be able to visit," said Johan Dybdahl, a Juneau assemblyman and president of a tourism enterprise that caters to cruise ships. Juneau alone estimates it would lose in a single season $68 million in direct spending from ships that brought a million passengers to the city last year. At the heart of the conundrum lies century old maritime laws and a dispute that began thousands of miles away from Alaska in the balmy waters of Hawaii. The Passenger Vessel Services Act of 1886 and the Jones Act of 1920 are meant to protect the U.S. passenger vessel trade from foreign competition. The major cruise ship companies fly the flags of countries like the Bahamas, Panama and Bermuda where they register their ships to avoid paying higher taxes, higher labor costs and other requirements of the U.S. flagged ships. As foreign flagged ships, they are prohibited from transporting passengers between U.S. ports unless they include a stop in a foreign port. The companies, however, have found ways to limit the pain. Ships heading to Alaska from Seattle often spend half a day in Victoria, B.C. Passengers can leave the ship to explore the town's quaint byways and load up on fudge and T-shirts. But vessels headed for the Hawaiian islands want to cover the many open ocean miles quickly. Steaming out of San Diego and Los Angeles, they generally duck into Ensenada, Mexico, for about an hour in the middle of the night for cursory compliance with the law, at best. Norwegian Cruise Line recently cried foul over the Ensenada touch and go, claiming companies were using the stop to evade federal law. Since 2004, the Miami-based company has invested $1.3 billion to deploy the only ocean-going cruise ships under the U.S. flag. Their purpose was to offer a unique island-only cruise. But foreign ships, with bigger faster engines able to traverse the ocean more quickly, have flooded the market leaving the U.S. ships struggling to compete. Under the direction of the U.S. Maritime Administration, the proposed rule was written to curtail the foreign ships' time in the islands and help level the playing field. Last year, NCL America blamed softening prices and its decision to pull its newest ship, Pride of Hawaii, out of the islands in part on increased competition from foreign-flagged cruise ships that had expanded their offerings in Hawaii. The company also attributed its higher payroll and other related expenses on the additional cost of maintaining a U.S. crew. The catch is that the rule applies everywhere, not just to Hawaii. John Binkley, president of Alaska Cruise Association, said the competitive imbalance in Hawaii doesn't exist in Alaska where U.S. flagged cruise ships are small exclusive ships that enjoy a specialized niche. The federal register logged over a thousand comments during the public comment period, which closed late December. From members of Congress to a beauty salon operator in Bar Harbor, Maine, many protested the broader application of the rule. Alaska Gov. Sarah Palin urged the agency to withdraw its proposal and do a thorough analysis, adding that the rule's short notice left those affected with little time to properly respond. If ships are redeployed to British Columbia to avoid the 48 hour requirement, the biggest loser would be the Port of Seattle. Seattle has sunk $35 million into cruise ship terminal improvements in recent years and grown from six sailings in 1999 to an expected 211 this year. "It would be a significant threat to our cruise industry here in Seattle," said port spokeswoman Charla Skaggs. "They've sunk all of this money into cruise facilities and now the government is changing the rules," said Aaron Ellis, communications director for the American Association of Port Authorities, one of many groups trying to change the rules. The federal agency did not do an economic analysis of the new rule, deeming it unnecessary, said Harold Singer, chief of the Department of Homeland Security's regulations branch. Singer declined to comment further saying the public comments are still under review. It's unclear how companies will react if the rule goes into effect. Holland America's John Shively is not sure his company even has a fallback plan. "I do think people are hopeful that enough commotion was raised that the federal government will look at it again," said Shively.